Olive 4HD review | What Hi-Fi? Is the CD player an endangered species? Not yet, perhaps, but it seems its hegemony is slipping: high-quality iPod docks and DACs are becoming increasingly popular, while Squeezebox and Sonos are happily carving up the music-system middle-ground, leaving the high-end to Linn, Meridian, Naim and, as of today, Olive. Yes, Olive. You won't have heard of the company before, but rest assured this could well be one of hi-fi's most talked-about brands in 2010. It's California-based, founded and run by a German, and its hugely capable 4HD hard-disk music server can deliver hi-fi sound so reassuringly, familiarly British that even ardent CD aficionados will surely find it difficult to dislike. With 2TB of storage, it's also capacious enough to satisfy the keenest digital music collector: even at best (uncompressed) quality, the Olive can accommodate up to 3000 albums, which ought to be enough for most. Use FLAC, which sounds perfectly acceptable to most ears, and that capacity grows to an improbable 6000 discs. Loading it with your music will take time, of course, although some dealers may offer disc-loading services (where your CD collection is ripped to the 4HD for you). Ease of use is another major facet of Olive's mantra. The 4HD is about the same size as a regular CD player, looks a little like one as well, and, thanks to conventional control keys on its fascia, can even be used like a CD player, too. But we think most will prefer to use its beautiful 4.3in, 480 x 272 resolution colour touchscreen, with its clear, intuitive and thoroughly attractive menus. It's fast, effective and readily visible from across a room. And a free iPhone/iPod Touch app is available too – which is just as well, as the supplied remote control is more functional than desirable. Internally, the Olive sports 24-bit/192kHz PCM 1792A digital-to-analogue conversion from Burr-Brown – usefully, this can be used as an offboard DAC for other digital sources too, thanks to the 4HD's inclusion of a digital input. Alternatively, there are both coaxial and optical digital outputs, so if you'd rather connect your Olive into an offboard DAC or digital-ready amplifier, you're covered. And there's even an HDMI connector, so you can display the 4HD's album art on your TV. Careful attention to detail means the Olive goes about its business in silence: the hard-drives are housed on eight layers of noise-isolating material, while the fanless configuration means your listening won't be unduly interrupted. Connected via analogue interconnects into our reference system, the 4HD's sound is excellent. Out of the box, the 4HD comes pre-loaded with a 12-track 24-bit Chesky audio sampler designed to illustrate its sonic potential. These are stunningly transparent and precisely imaged – a genuine leap up in quality over 16-bit CDs. WAV and FLAC rips from 'regular' CDs are deeply impressive too, with Hans Zimmer's muscular Dark Knight soundtrack offering plenty of sonic drama. And comparing the CD quality with that of Marantz's excellent CD6003 was interesting, too: there wasn't much in it, with the 4HD proving, at the least, an attentively rhythmic and expressive listen. Of course, as any music server ought to be, the Olive's wi-fi-enabled (and also sports an ethernet connection if you prefer a wired link). 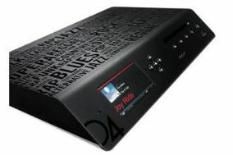 That means it can retrieve album art for your ripped CDs, gives it the ability to access internet radio and – most exciting of all – means it can stream music to up to 10 other Olive components. The company makes its own 'client' players, called Olive 2: these offer a similar user interface to the 4HD, but omit the hard-disk and CD drive, and cost £650 each. And now for the kicker. There are cheaper 500GB and 1TB versions of the Olive available, but even the most costly 2TB capacity model tested here will set you back less than half the cost of the £4500 Naim HDX, and a third of the £6285 tag for the Meridian Sooloos – yet in many ways it's a solid rival to both. So, odd as it sounds for a unit of this price, this is a genuine bargain. Now do you see what we mean about Olive?